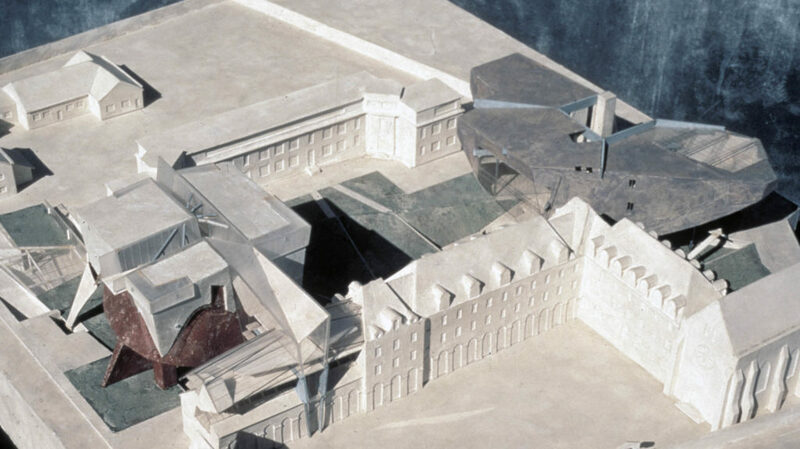 The design strategy for the Francis Poulenc site is compelled by the constructed history of Tours, and simultaneously advocates an architectural re-writing of that history. 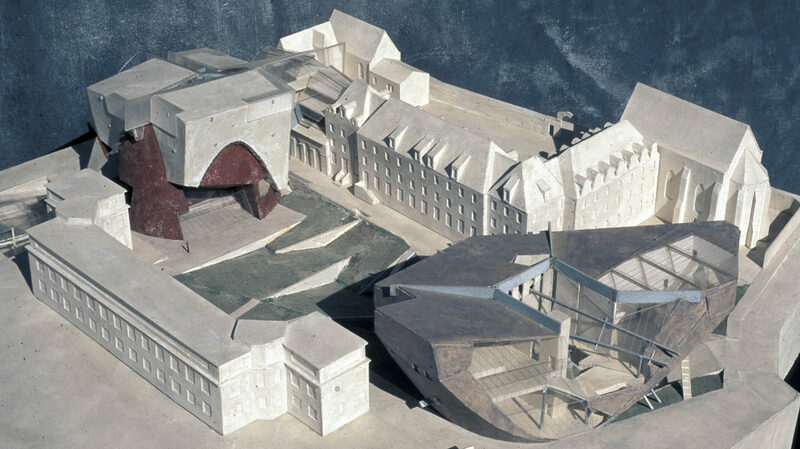 The literal and conceptual foundation of the proposal is a dislocation and reconstitution of the site, excavating and reshaping the earth from the Rue F. Clouet and the Park Mirabeau on the east to the Rue du Petit Pre on the west. The land is reformed as a series of contiguous, gently sloping grass plains, retained by concrete masonry walls. The plains slope north to south and south to north, intersecting at an irregular valley which slopes from west to east. So the first act is to rupture the site, producing a fresh landscape. Four new structures ride on this landscape. At the east end of the site is the Center for Contemporary Creation. The building begins as a cone. The cone tilts north toward the chapel, cinemas, and the Rue F. Clouet. An imagined vertical plain on the designated property line slices the cone vertically. Only the cut volume within the property line remains. So the Euclidian origin is almost unrecognized in the transformed object. The Second major building is the Theatre, which closes the site on the west end as the Center for Contemporary Creation does on the east. Together the Center for Contemporary Creation and the Theatre, in combination with the existing high school (south) and the original musicology/conservatory (north) contain the new public garden. The Theatre is designed in four steps. The first object, as in the Center for Contemporary Creation, is Euclidean – a vertically positioned cylinder. The cylinder is metaphorically squeezed, attacked from the south (by the high school) and from the north (by the west end of the old conservatory building). So the first gesture is another disingenuous deference to two adjacent, existing buildings. The next step is to lift the cylinder and insert a portion of a sphere underneath, forming the ceiling/soffit/underside of the building. Third, the squeezed cylinder/sphere is supported at the ground plain by two walls, perpendicular to one another in plan. Last, a cube is deposited over and around the object, divided into three pieces, and manipulated to accommodate seating, access, and production requirements. 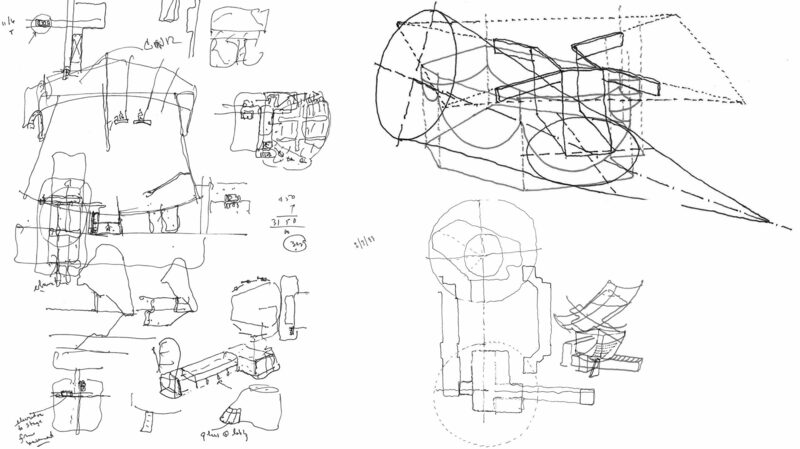 Where the boxes intersect the deformed cylinder, the boxes are cut and portions are removed, prioritizing the force and form of the curve. Below the ruptured landscape is a three level garage, entered from the Rue du Petit Pre, exited on the Rue F. Clouet. Pedestrians move vertically from the garage to the garden above, then to the Center for Contemporary Creation, the Theatre, or other buildings on the site. The fourth new building is directly north of the Theatre, straddling the one story shed roof of the former cafeteria. An equal portion of the original roof on both sides of the shed is cut away and replaced with a continuous skylight. At the skylight centerline, the apex of the shed, a new tubular steel beam supports pipe columns above which hold two new floors for the expanded C.N.R. Below the skylight a new level is added in the former attic space of the old cafeteria. The roof form of the new structure is a glass analogue to the existing gabled roof of the adjacent four story conservatory. The new glass roof intersects the old shed roof at the east edge of the C.N.R. addition. The final new structure is the Cafeteria, an excavation in the sod plates south-west of the Theatre. The tilted Cafeteria roof, part grass, part glass, follows the order of the landscape plains. From the garden one looks down to the Cafeteria; from the Cafeteria one looks up through the glass roof to the Theatre flying above. The new architecture on the Francis Poulenc site is concerned both with dissolution and resolution, with pulling apart and pulling together. The architecture communicates both the contradictions and the tensions in the society for whom the project is made, and simultaneously reformulates these conflicts and shapes a new coherence. Tours doesn’t have a history. It has histories. The new architecture on the Francis Poulenc site will be one.